A Belgian enterprise, the Jet Squalus was designed and built around the Garrett TFE109 engine by General Avia in Italy. 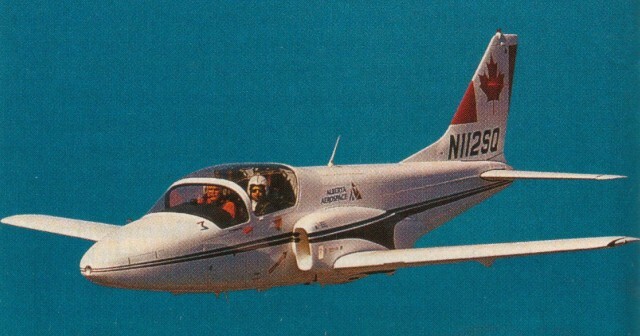 Designed by Stelio Frati, the prototype Jet Squalus made a successful first flight on April 30, 1987. Three prototypes of the "all-through" side-by-side seat trainer were built and flown to Belgium. The Squalus was promoted as "the first and only third generation global trainer", offering ab initio and advanced training from one cockpit. Two proto-types of the Jet Squalus are being built by General Avia in Italy, the first powered by a Garrett TFE-109 turbofan, and the second by a more powerful Williams International FJ-44. Following completion of initial flight trials the aircraft will be flown to Belgium, where production, marketing, and support of the “all--through” jet trainer will be administered by Promavia. The initial 1,330 lb st (5.92 kN) -1 unit was replaced by the Garrett TFE 109-3 turbofan of 1,600 lb st (7,12 kN). Light weapons and/or drop tanks can be carried on underwing hardpoints. No orders had been placed for the aircraft by 1988. Based in Calgary, Canada, Alberta Aerospace obtained the two prototypes built with plans to install Williams-Rolls FJ44-1a engines. Almost 80% of the structural and stress testing for certification was completed by Frati, who tested the airframe to +7 and –3.5G. With a 140 kt gear extension speed, the aircraft did not meet the 61 kt stall speed required for civilian certification for single engine, so the wing span was to be extended by four feet. A flight demonstrator was fitted with the Williams FJ44 engine. Initial ROC: 975 m / min. Engine: 1 x Garrett TFE 109-3 turbofan, 1,600 lb st (7,12 kN).